All sorts of methods have been used in the past to try to stop horses from kicking stables and stable doors: squirting water at the horse; shouting at it; throwing things; leaving it's feed until last ...and so on. The problem is, all these acts are seen as punishments by the horse and it connects the punishments with people. Therefore, it has not learnt to not kick the stable, only to stop kicking when it sees a person. The Quitkick devices are the only effective cure for stable kicking because the horse's actions are immediately met with the same undesirable reaction regardless of any other circumstances. QuitKick is activated only by the horse and the horse soon learns to associate the water jets with nothing other than his own actions. 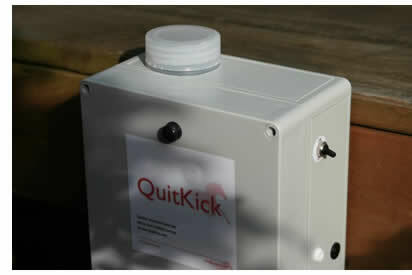 Quitkick systems teach the horse to stop kicking the door and/or stable. Other methods simply make it more difficult. They do not address the horse's desire to kick the door.